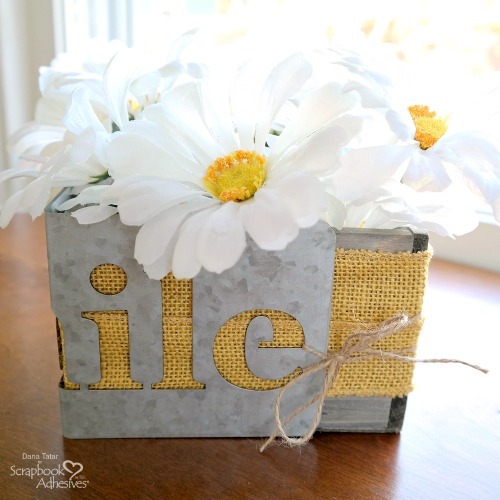 For the longest time, intricate words and pieces were the bane of my crafty existence. It was a mess to add adhesive to them and I never quite covered them right. Once I discovered Adhesive Sheets, that all changed. 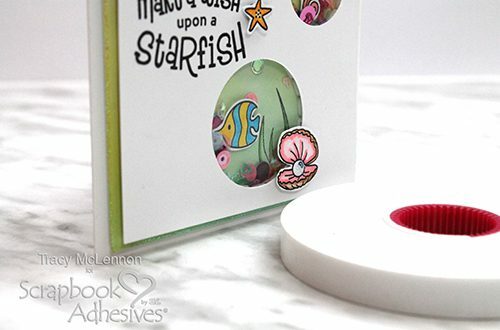 Adhering intricate words and other intricate pieces went from being a frustration to an easy go-to technique of turning them into a sticker! 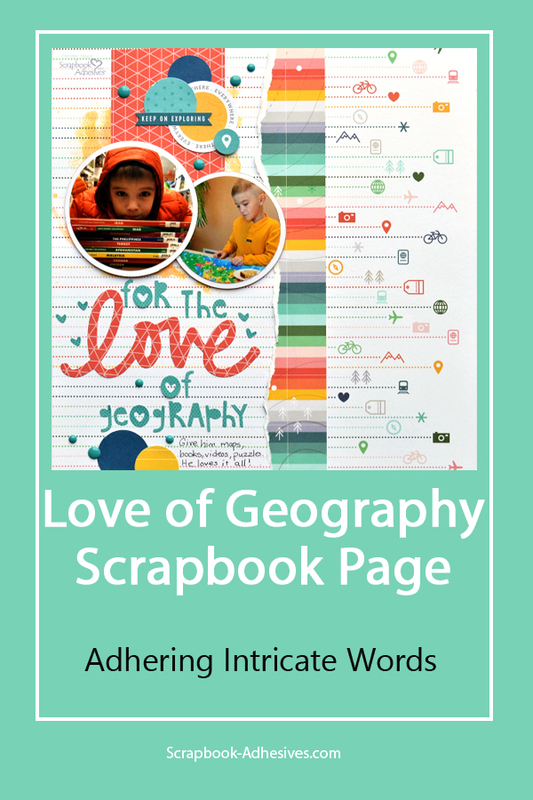 It’s Christine joining you today with a scrapbook layout featuring, you guessed it, an intricate word! 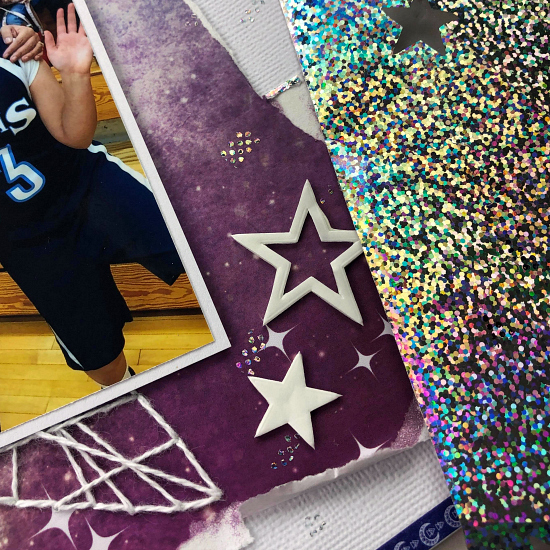 Our Adhesive Sheets are available in three different sizes, 4 x 6 inches, 6 x 12 inches, and 12 x 12 inches, which mean that no matter how big your word is or what type of machine (manual die cut, electronic die cut, scissors, punches) you are using, you can make them work for you! For this title, I used the 6 x 12 inch sheet because my metal die was just a little too big for the 4 x 6. I simply trimmed my patterned paper into a rectangle, removed the yellow liner, and then set it on the Adhesive Sheet. Then I ran it thru my cutting machine. 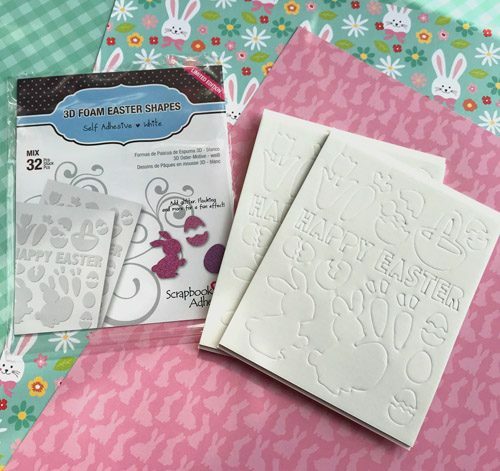 Turning it into a sticker with the Adhesive Sheets makes adhering intricate words a piece of cake! To add some dimension to my layout I popped up my pictures using Crafty Foam Tape. 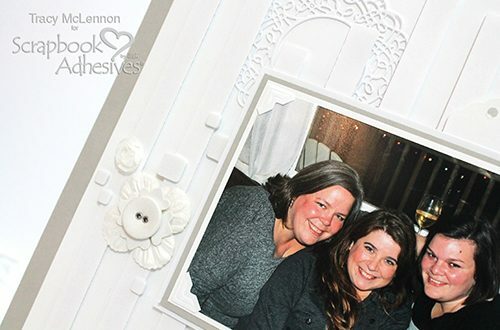 I also used a 3D Foam Square to pop up the circle in my embellishment cluster above the pictures. 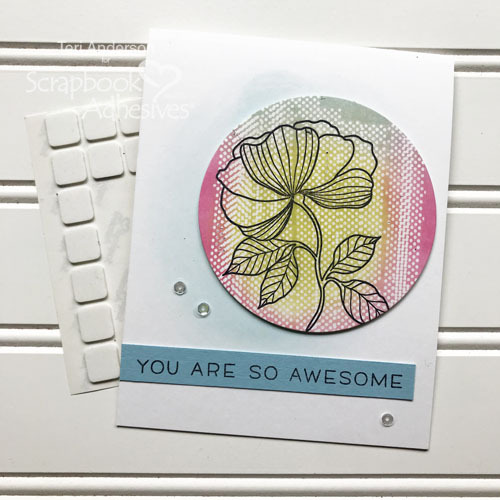 Thanks so much for joining me today and for taking a closer look at how the details of a scrapbook layout come together! 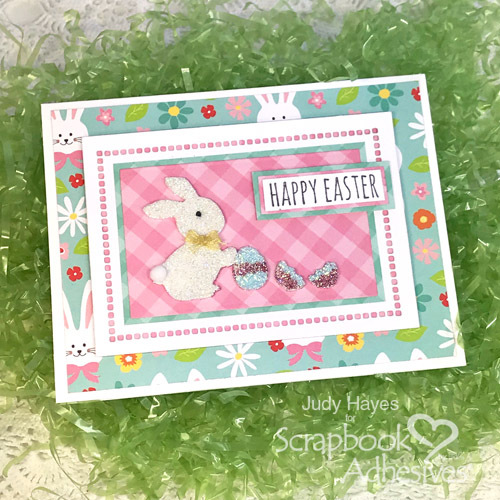 Do you like to get inky when you make cards and scrapbook pages? 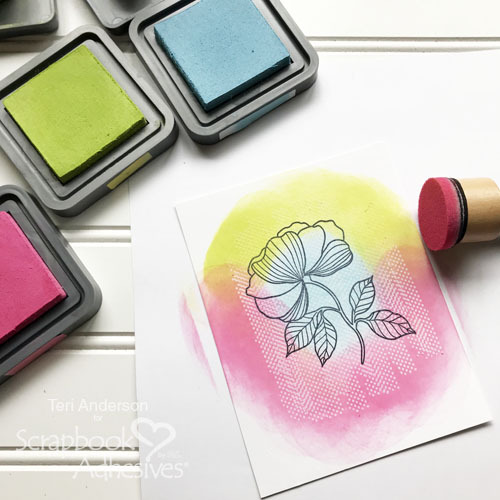 Teri here to show you a card using a fun ink resist technique! 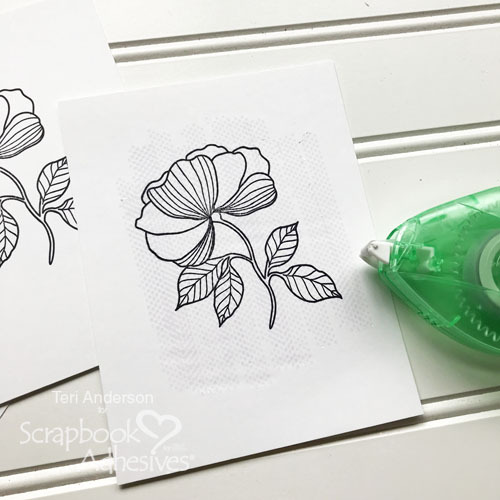 This inking technique is easy to pull off with the E-Z Dots ® Repositionable Refillable Dispenser! Let’s get started. 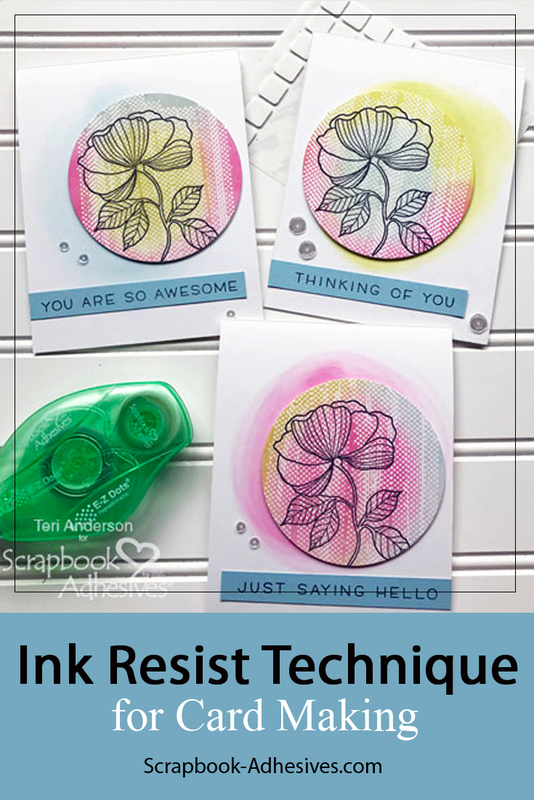 Start by stamping an image with black ink onto a panel of white cardstock. Use the E-Z Dots ® Repositionable Refillable Dispenser to roll several lines of adhesive dots over your stamped image. You can add as many lines as your heart desires. 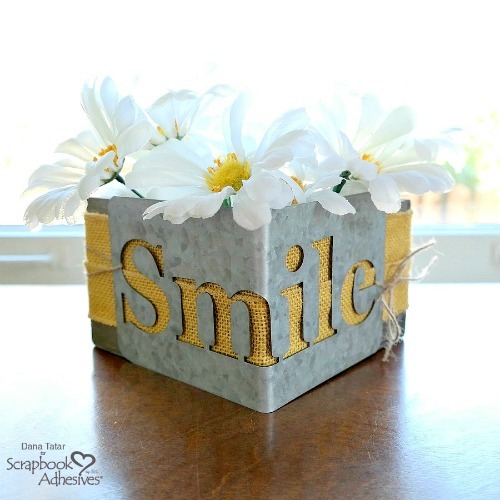 Set your panel on a piece of scratch paper. Take one ink color and slowly apply it onto the panel with a sponge. Be gentle and not apply too much pressure as you ink. Now, you are going to add two more colors of ink to the panel. Continuing adding ink until your image is completely covered. Once are happy with the inking, and the ink is dry, you can use your fingers to rub off the adhesive. Go gently in a circular motion and the dots come right up! I recommend rubbing the panel with a sponge once you’ve removed the adhesive, just in case you’ve missed any flecks. By the way, the sponge I used is a cosmetic sponge I found at the dollar store! Now, you are going to use the panel on a card. Cut it into a circle. 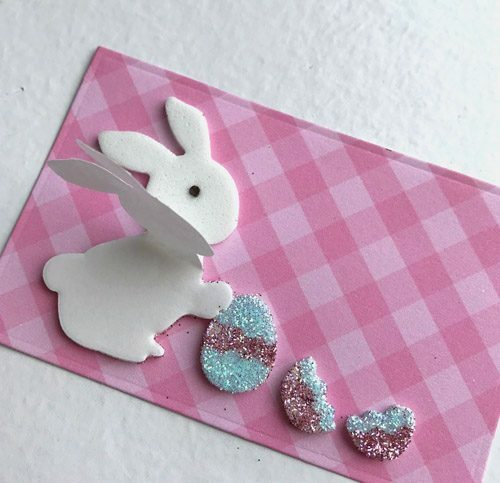 Create a card from a piece of cardstock. 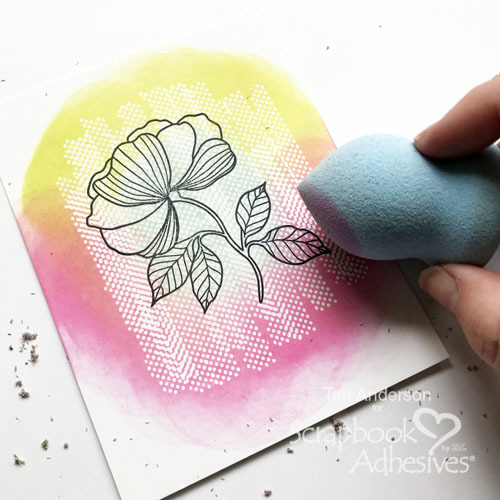 Sponge some ink onto it and then adhere the circle to the card with Thin 3D Foam Squares. I like to use the squares because they give elements on cards ‘pop’ but not too much. That way my cards aren’t too bulky and cost-prohibitive to mail. 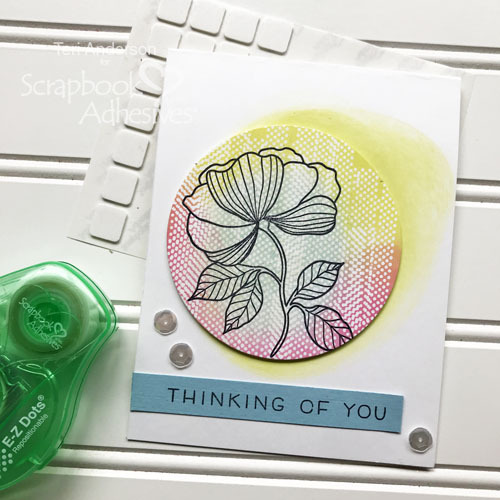 Stamp a sentiment on a strip of cardstock. Adhere it below the circle. 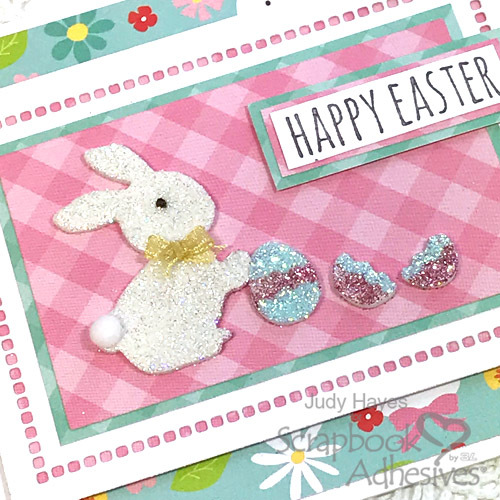 Finish the card with a few sequins or gems! 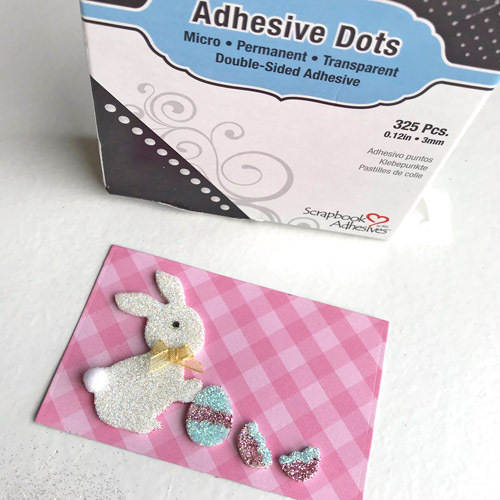 The micro-sized Adhesive Dots work great for small embellishments. 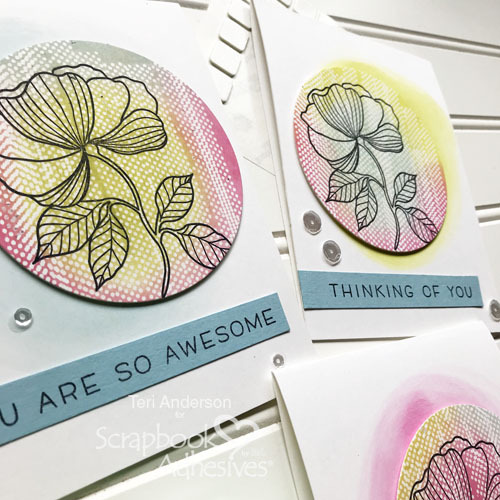 The thing I really love about this technique is you can create a lot of cards by using the same design. I also love that you can make each of your cards unique by using different ink colors. Thanks for stopping by today. If you give this technique a try, I’d love to see your results! Share a link with me on this post. 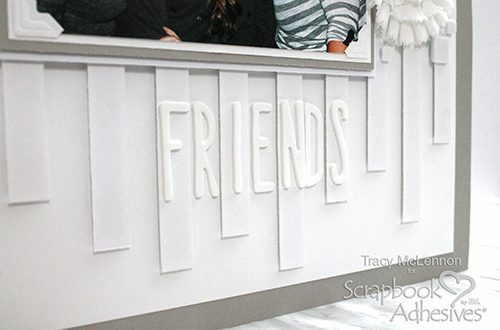 Welcome back, scrappy friends! Tracy here, and today I have a layout honoring my close friends in a simple yet striking monochromatic color scheme to share. 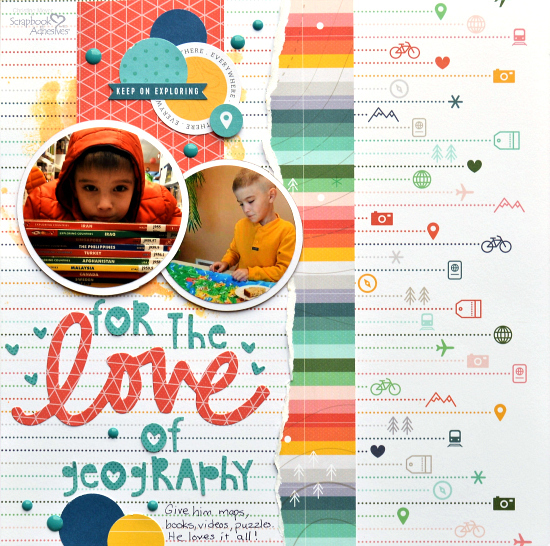 Sometimes you just don’t need a bunch of patterns and embellishments to create a beautiful scrapbook layout. 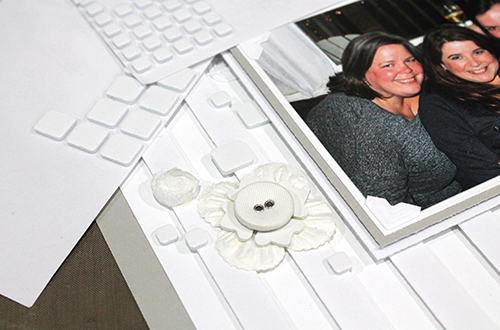 Here are all of the details on how I created this layout using all white products. 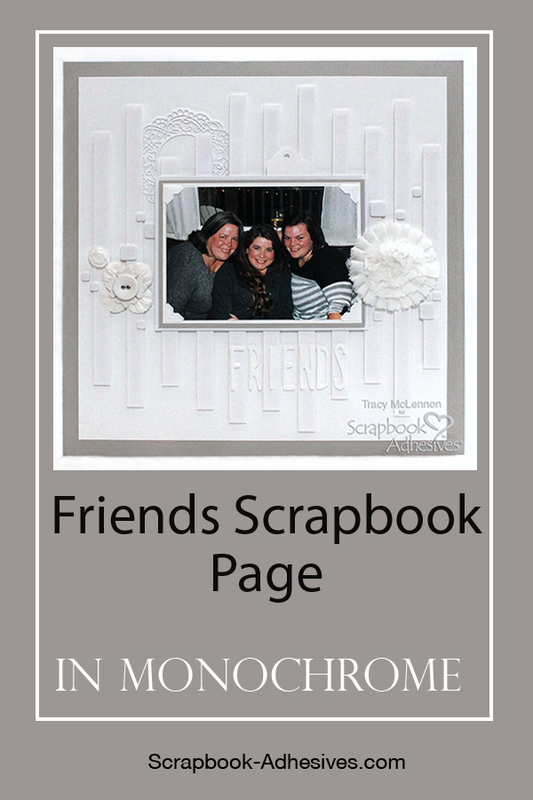 The layered background is a piece of 12×12-inch grey cardstock and a piece of white cardstock cut to 11 x 11-inches. Adhere these pieces together using the E-Z Runner® Permanent Strips Refillable Dispenser. 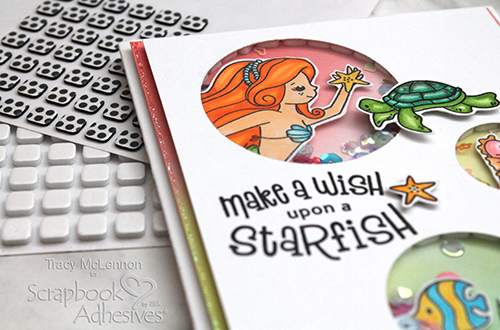 Add the white cardstock die cut using Adhesive Dots Micro. 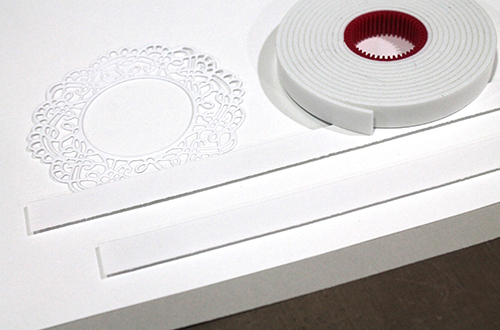 Cut strips of white cardstock that are 0.5″ wide, and a length of between 9-11″. 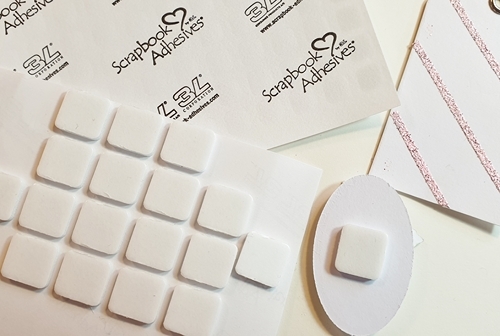 Adhere these strips all across the layout using Crafty Foam Tape White, spacing them about a half inch apart. Mat the photo in white and grey cardstock. 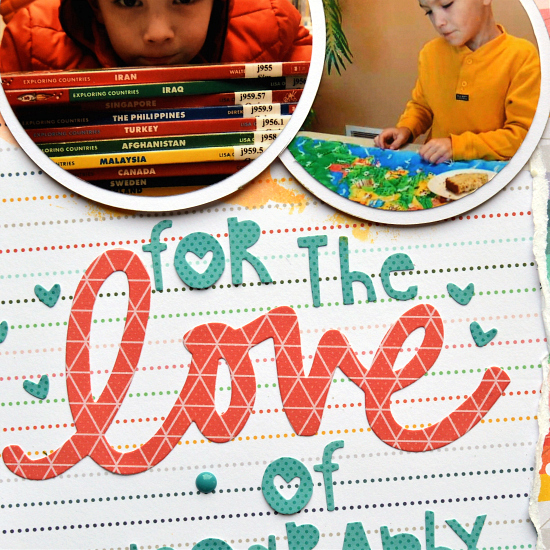 Add Creative Photo Corners White to the corners of the photo. 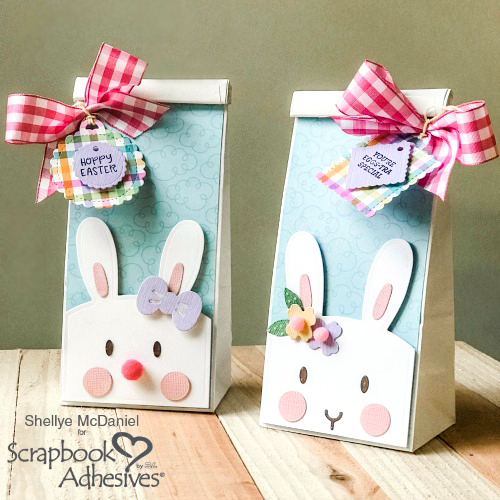 Adhere these layers together using E-Z Runner® Permanent Strips Refillable Dispenser, then add another white cardstock mat, but adhere to the others using Crafty Foam Tape White. 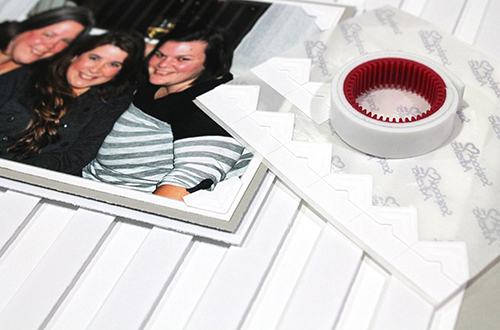 Adhere the matted photo to the middle of the layout using Crafty Foam Tape White. 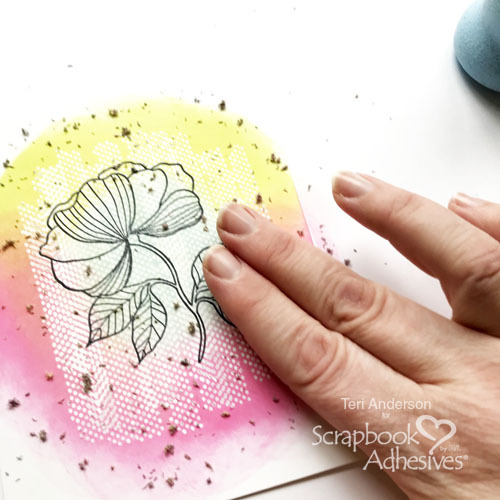 Add the white flowers using Adhesive Dots Medium. 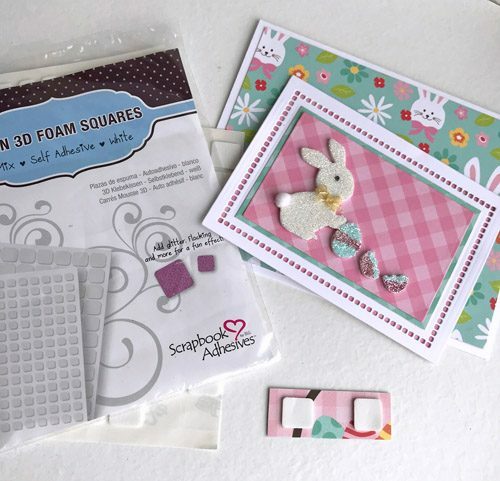 Next, add 3D Foam Squares White Mix as embellishments themselves. They adhere to different levels of the layout for lots of monochromatic dimension. 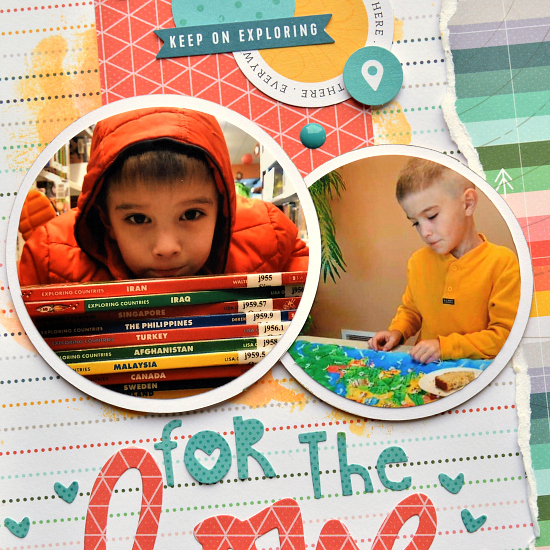 These thin letter stickers were perfect for the layout. I added the first letter onto one of the raised strips, then the next in between the strips and so on. 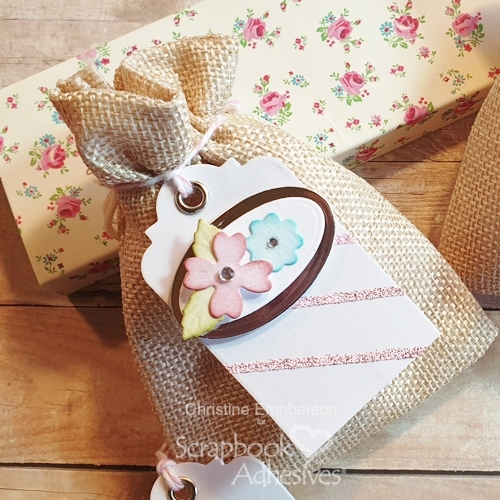 Hi everyone, Christine here today sharing with you some Floral Mini Tags, perfect to adorn little gift bags or boxes, and easily made with Scrapbook Adhesives by 3L® adhesives. 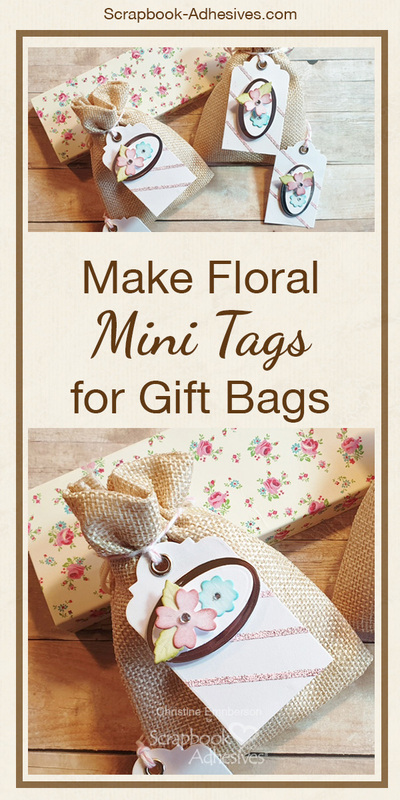 To start, I selected four white mini tags. These were purchased but you can die-cut them too. 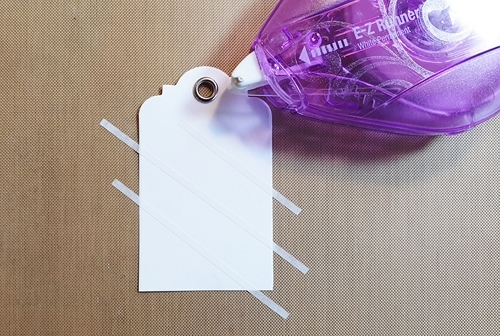 Using the E-Z Runner Micro Refillable Dispenser, apply diagonal strips. 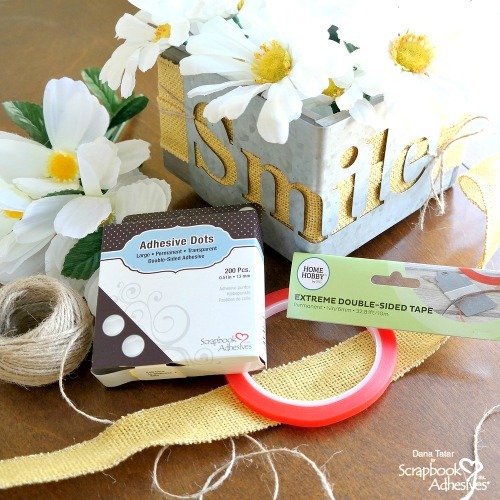 This clever dispenser applies strips that are only 1/8″ wide and it is centered on the liner for easy application. 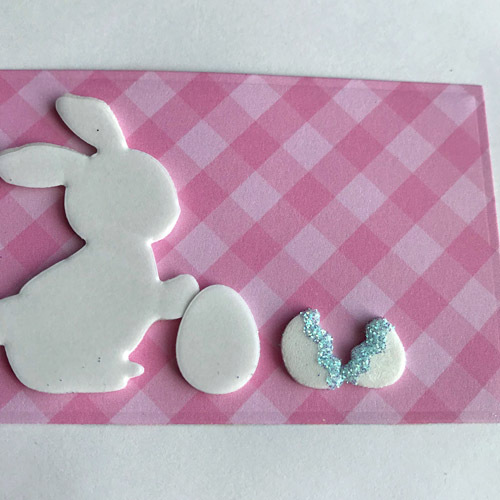 Cover the mini tags with embossing powder, tap off excess and set with heat tool. The narrowness of the tape makes the stripe design look light and delicate. 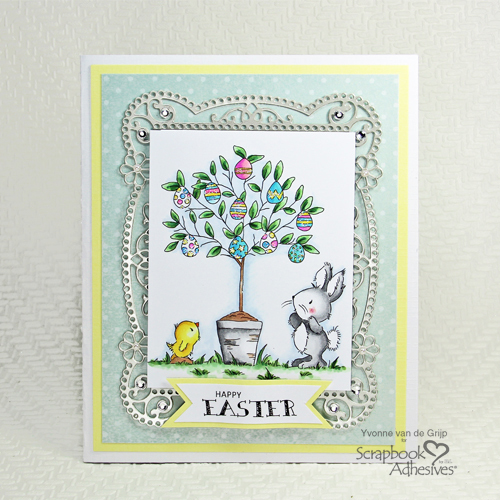 Next, I selected some die cuts, small oval, leaves, and flowers. I colored them with various distress inks. 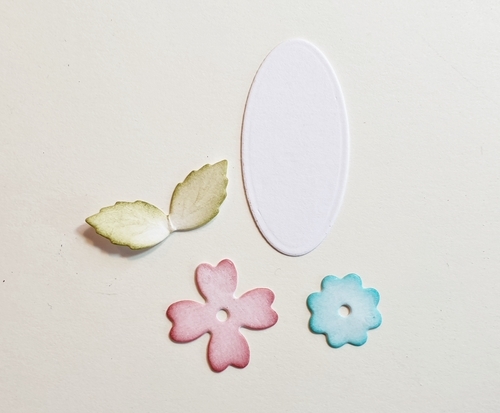 Assemble the flowers and apply 3D Foam Circles White to the reverse. 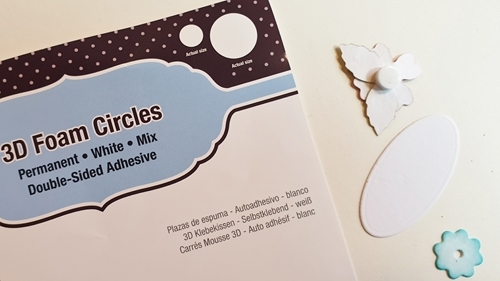 Available in two sizes in each pack, the smaller circles hold tiny embellishments securely in place. Switching to 3D Foam Squares Regular for the reverse of the larger embellishments. I finished with an additional touch of twine and little gemstones to the flower centers. 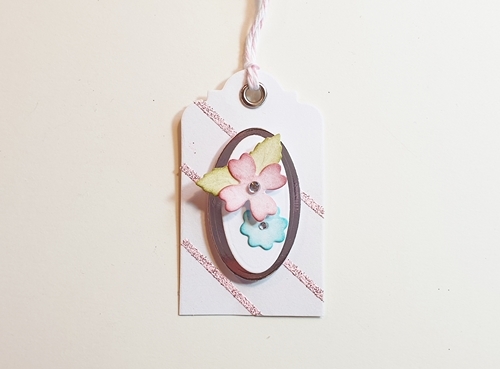 Here is another look at the mini tags! 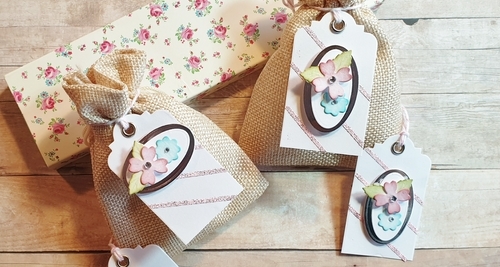 By varying where the ovals are placed, the tags are different but still have a coordinating look. Thanks for stopping by and don’t forget to check out the great products on the website. 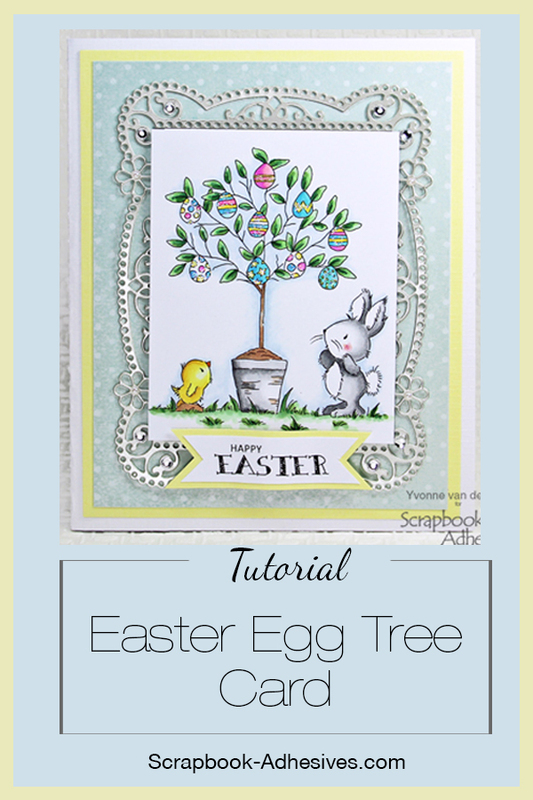 Hi everyone, Yvonne here with a cute Easter Egg Tree card. For the background, I used an intricate die-cut. 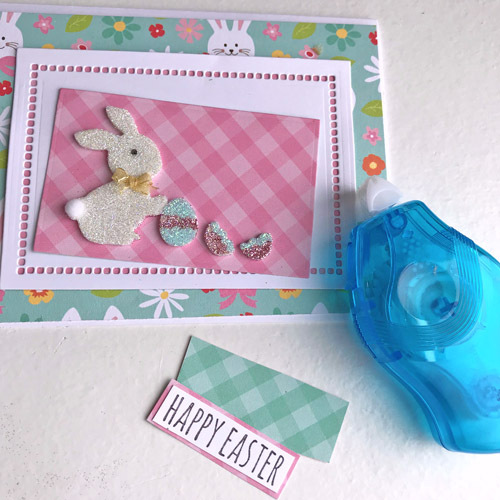 The E-Z Runner® Petite Permanent Dots Refillable Dispenser is a great way to glue intricate designs onto a card without leaving glue residue. 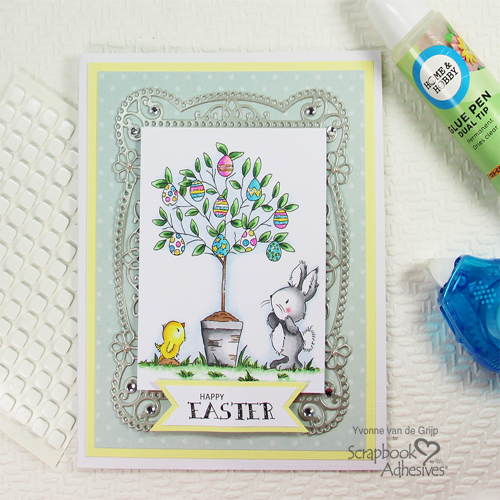 And the HomeHobby Dual Tip Glue Pen is a great tool to add tiny glittered details to your card. Let me show you how I made the card! 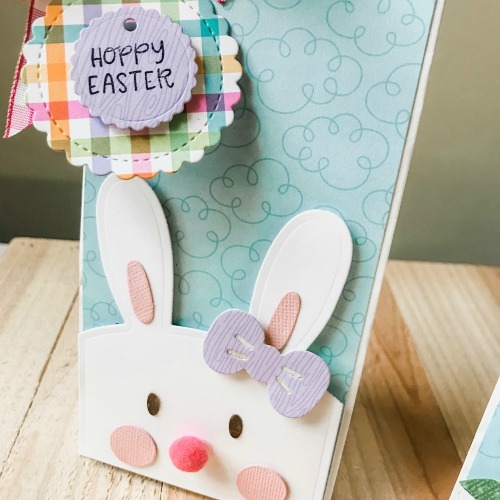 Start by mounting a piece of dotted cardstock to a yellow panel and then onto a white card base, using the E-Z Runner® Ultra Strong Refillable Dispenser to adhere all the layers. Did you know that E-Z Runner® Petite Permanent Dots Refillable Dispenser is a great way to adhere intricate die-cuts to a card…why? Well, because this adhesive consists of tiny dots! 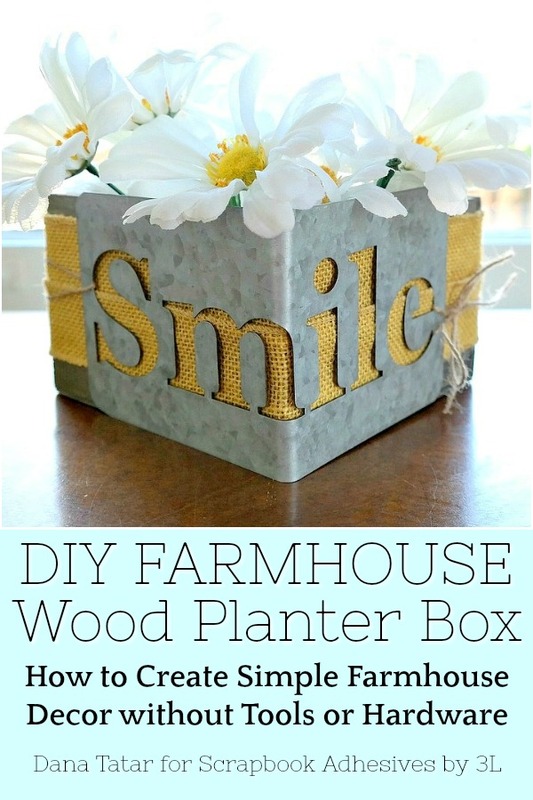 Take a piece of copy paper and on top, place the silver die-cut with the backside facing up. Simply push the lid open towards the casing and click to lock. Now you’re ready to use the E-Z Runner® Petite Permanent Dots Refillable Dispenser. 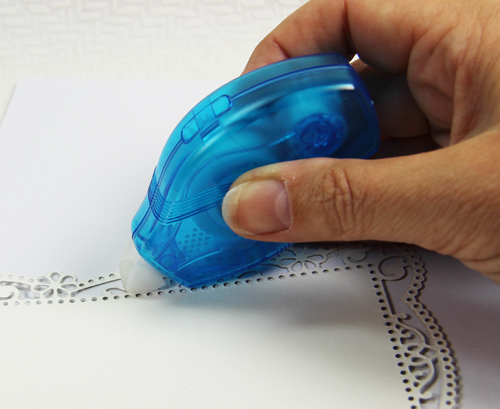 Run the E-Z Runner® Petite Permanent Dots Refillable Dispenser over the back of the die-cut. 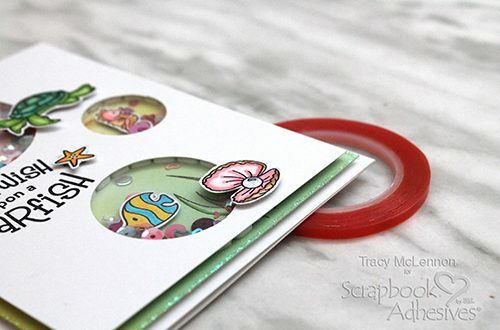 When you lift up your die-cut you will see that the excess adhesive sticks to the copy paper and leaves no residue! Next, place the die-cut onto the card base and adhere. Yep…it’s that simple! Gently bend the edges of the banner with your fingers and adhere to the card. I stacked two 3D Foam Squares White Small Size on each side. In the middle, I used three to lift it up a little extra. The Dual Tip Glue Pen has two ends: a brush tip for larger applications and a very fine tip for precise application. 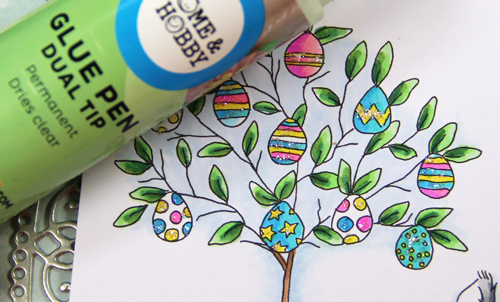 Using the fine tip, I add my glitter to the details of the Easter Egg Tree. 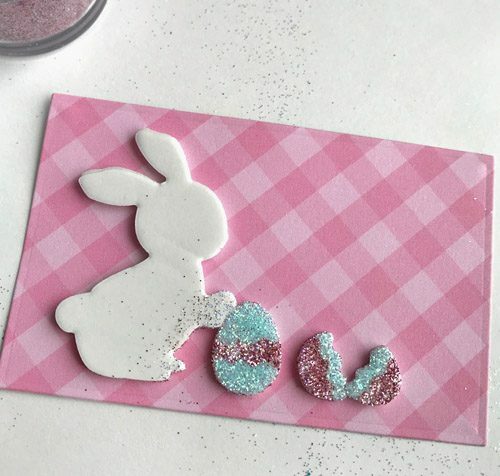 Simply add glue to the detailed designs and immediately after sprinkle clear glitter on top. Tap off the excess and let dry. Lastly, adhere rhinestones to the silver die cut. 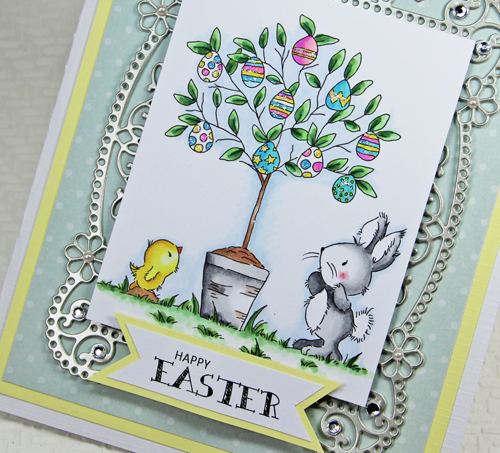 Your Easter Tree Card is finished! 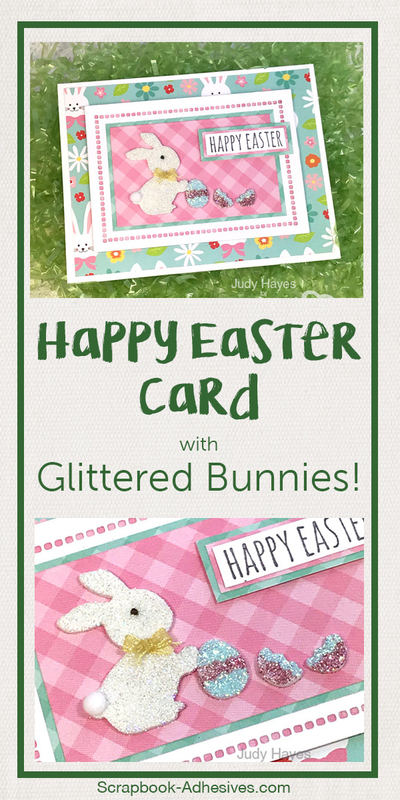 Wishing you happy crafting and of course a happy Easter, Yvonne. Have you jumped in on the galaxy trend? The more I dabble in it, the more I want to do with it. Knowing that my adhesives can enhance that trend even further makes it even more appealing. 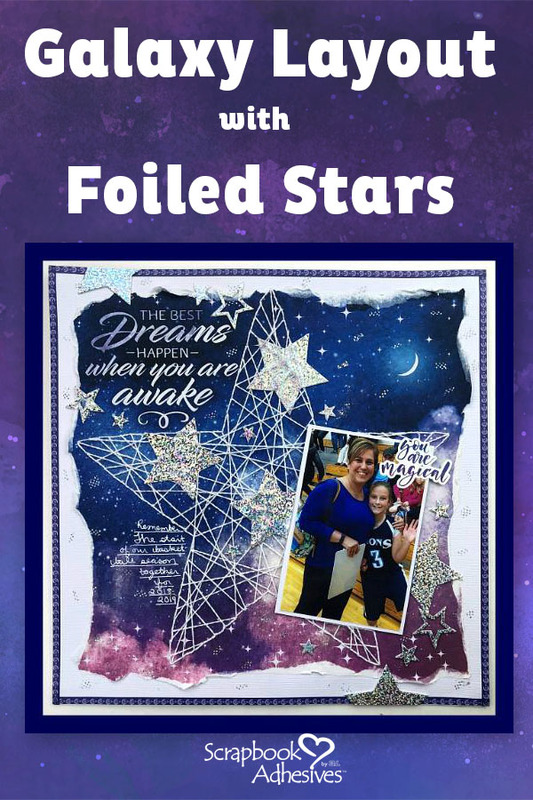 Hi, it’s Christine joining you today with ideas on how to make those stars twinkle on your galaxy style projects! This layout showcases A LOT of stars! 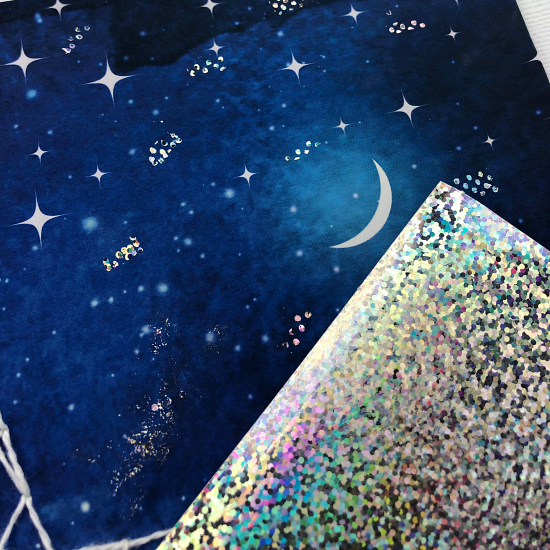 The patterned paper in the background has stars printed on it. Then I added a string art star. 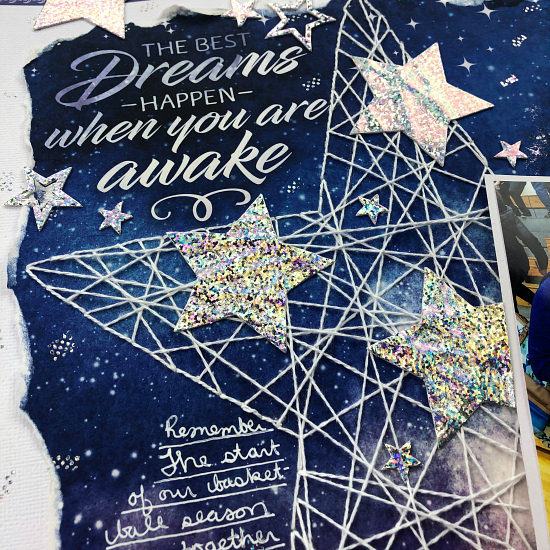 Next, we have “stars” created with the E-Z Runner Grand Permanent Dots. 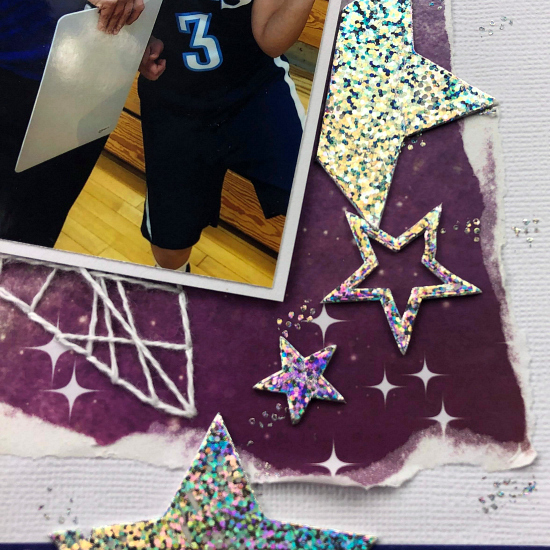 Finally, we have stars using the 3D Foam Stars and 3D Foam Creative Sheets! Let’s take a closer look at how I added all these! This was a really easy look to achieve. I just ran my E-Z Runner® Grand with the Permanent Dots Refill really quickly over the paper – it was almost more of a dab than an actual run. Sometimes that resulted in a chunk of dots and sometimes very little. Then I took my Metallic Transfer Foil Holographic Silver and rubbed it over the areas. I did this along the inside and outside borders of the layout. Because I knew this layout was going to be more “messy” than precise, I knew this technique could work. Additionally, I continued that approach by adding my washi tape border without concern for straightness and tearing my patterned paper edges. 3D Foam products are a standby embellishment for me! 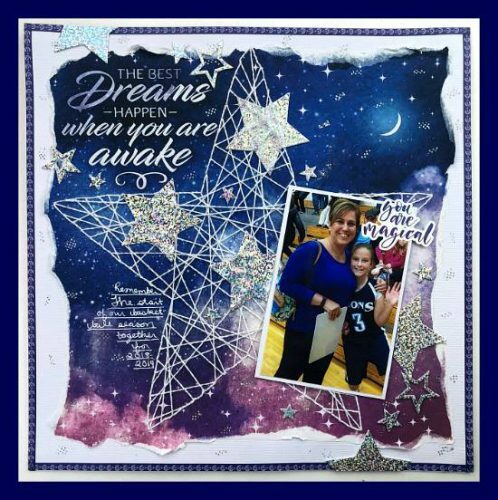 They allow you to personalize the embellishment and “Wear Your Adhesive on the Outside.” I added stars from the 3D Foam Stars in both the top and bottom corners. Once you remove the top liner, they are exceptionally easy to add foil! Just a quick rub with the foil side UP and it’s on there! As I finished off my layout I knew I wanted a few more big stars. But I didn’t have quite what I needed. In light of that, I pulled out the 3D Foam Creative Sheets and a star punch. I punched a few out and applied foil in the exact same way as above. I wasn’t sure if the 3D Foam Creative Sheet was going to be too thick for my punch but it wasn’t! 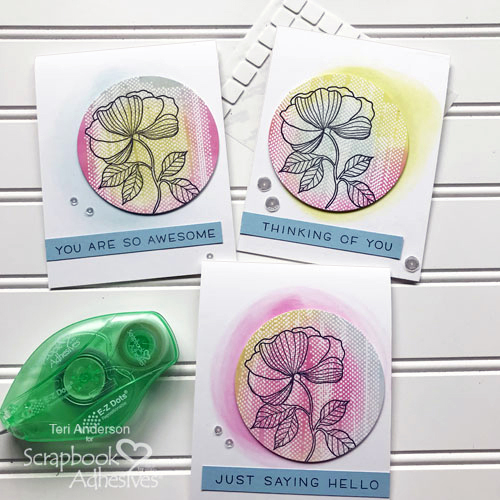 Hello card making friends! 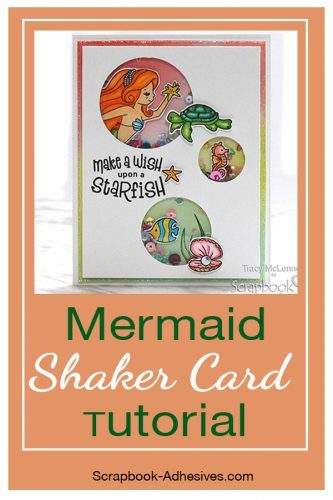 Tracy here, and today I have a fun and sparkly Mermaid shaker card to share. 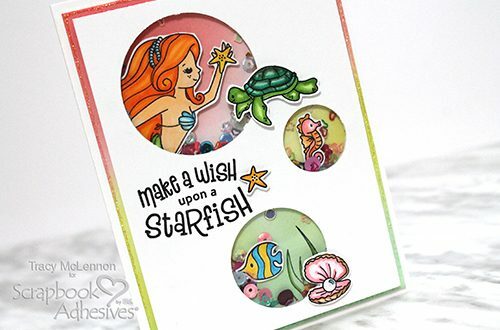 Everyone has a person in their life that would love to be a mermaid. 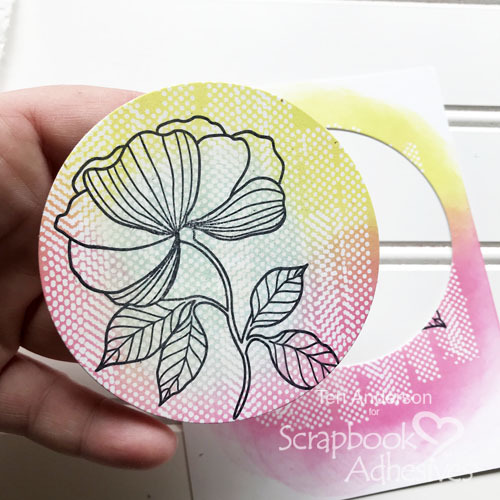 Once the white card front is created using white cardstock and circle punches, I adhered a piece of acetate in behind with Extreme Double-Sided Tape 1/8in. 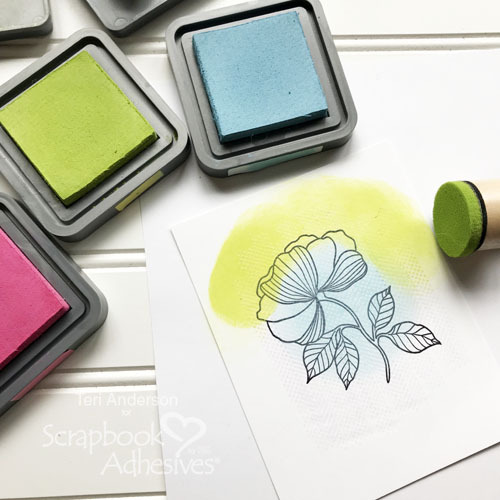 Next, I created a blended background using ink and blending tools on white cardstock. Use the holes in the top as a guide where you would like the colours to fall. 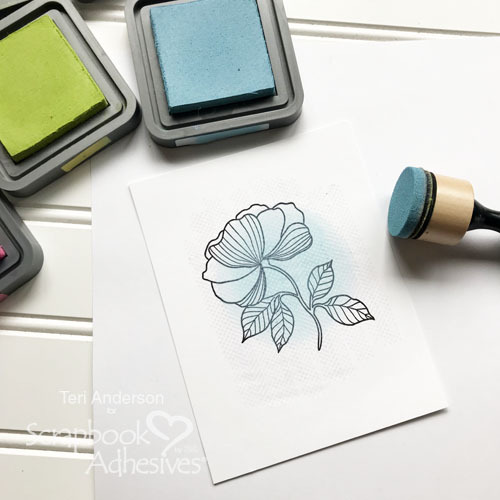 Now I can stamp my images in black ink so that I am able to colour using markers and a water brush. 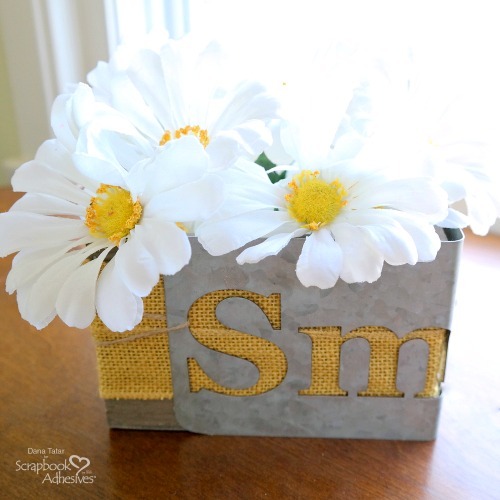 Use 3D Foam Squares White Mix to surround the holes and pop up the other negative space too. In the case of my mermaid image, I wanted to create space between her and the acetate. I used Thin 3D Foam Squares Black Mix above and below the mermaid image. Note: In my craft space, I have all of my 3D Foam Squares close at hand. I will often have my Thin 3D Foam in black, and my regular 3D Foam in white. That way in the heat of the crafting moment I know what I’m grabbing easily. 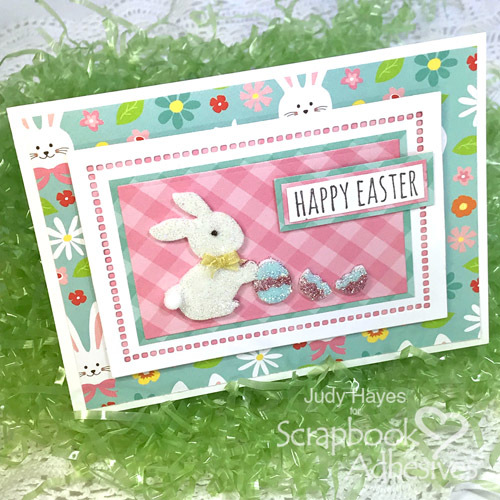 The stamped and coloured images on the top of the card are added using Thin 3D Foam Squares Black Mix. 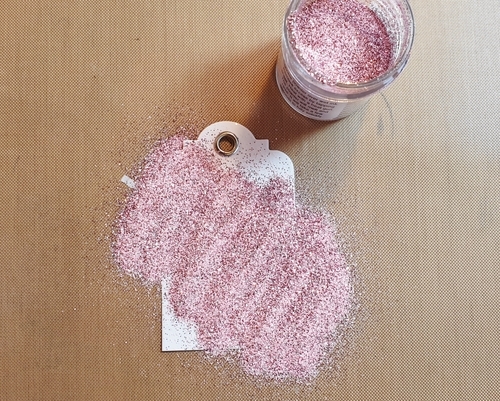 Once that tricky part of adding the blended background to the sequins filled shaker piece is complete. 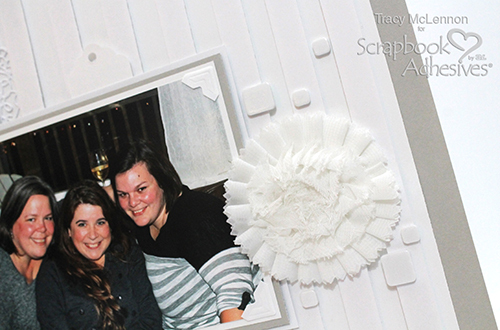 Then I added it to the white cardstock card base using Crafty Foam Tape White to assemble. 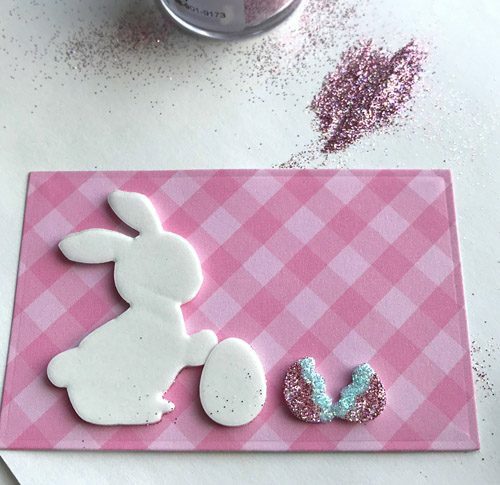 As a result, the next step will be is to add glitter glue for some sparkle. I added it around the edge of the inked layer, as well as to some of the sections of the stamped and coloured images. Greetings! 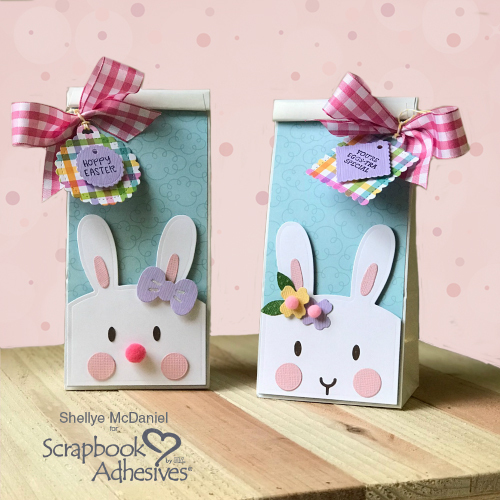 Shellye McDaniel here to share an adorable set of transformed bakery bags just in time for Easter. 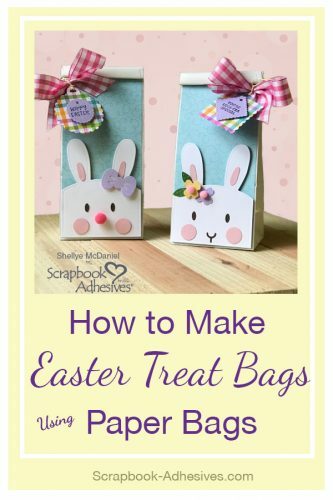 Enjoy this fabulous idea for creating Easter Treat Bags! To begin, I cut a background paper to cover the front of each bag and then used the Adhesive Sheets 4×6 inch to adhere the bag to the paper. 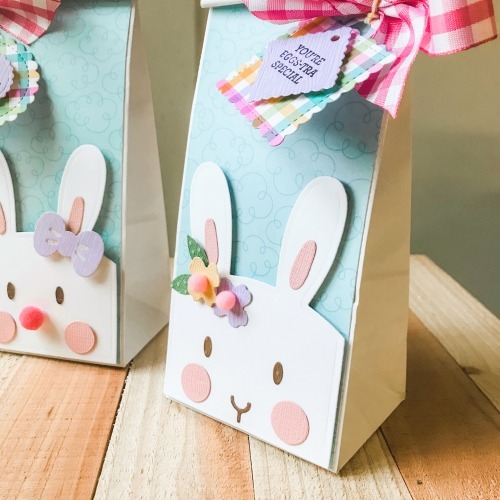 Next, I used a treat bag bunny die and its accessories to create the faces; the faces were attached to the bag with Crafty Foam Tape White. 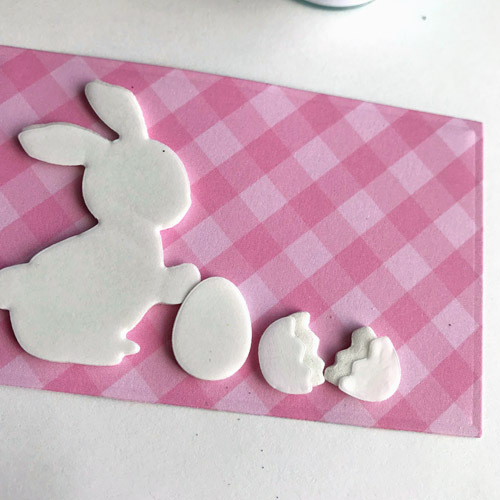 I chose the Adhesive Dots Large for attaching the cheeks and the Dual Tip Glue Pen for adhering the smaller pieces. 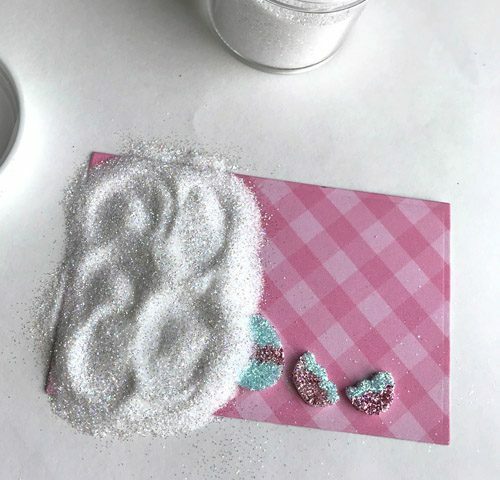 Wanting to offer some different textures on the Easter treat bags, I added a pom pom nose using the Adhesive Dots Small. I attached the die cut bow with 3D Foam Circles White Mix and the openings glittered. Lastly, I die-cut a few tags and layered them using 3D Foam Circles White Mix and then adhered to the top of the bag with Adhesive Dots Large.